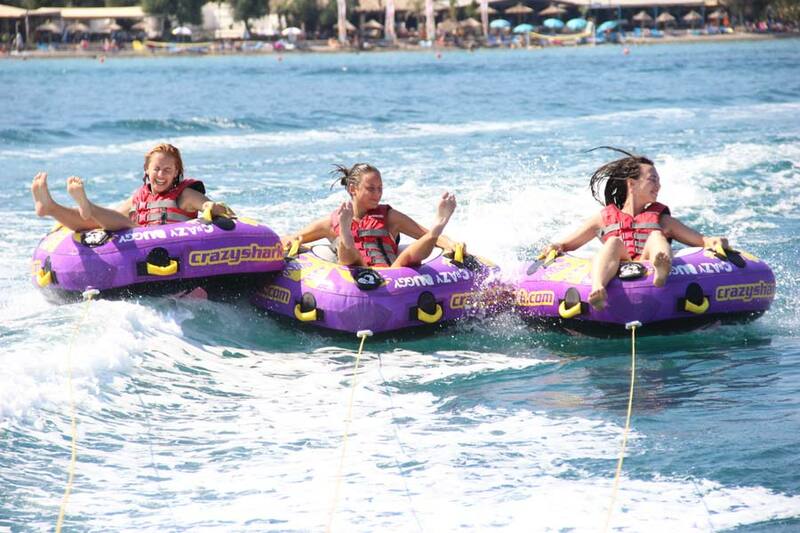 Water rings offer incomparable moments to families and friends, who seek for escaping and having absolute fun. Those who have already took the chance, have felt an unbelievable adrenaline rush and without any doubt they would do it again. The activity is exciting and the landscape constitutes the jewel of the Greek beauty. The only thing that is needed is a daring group of friends. Rings hit each other, spring above the waves, slide right and left from the boat. You are constantly in a situation of madness, whereas you enjoy it to its whole. Rings are an inflatable category, which can drive you crazy and offer you abundant laughter. You will narrate an adventure full of humor and funny snapshots, whereas you convince your friends to join you next time. Do it as you wish! Dassia Ski Club provides you with the possibility of choosing how you want your ride to be. This ride can function with two separate speeds, since you can adjust boat’s speed. The choice lies between a relatively quiet ride and a crazier one. This double potential makes the activity to be suitable both for smaller children and for young people, who adore speed and springing into the water.